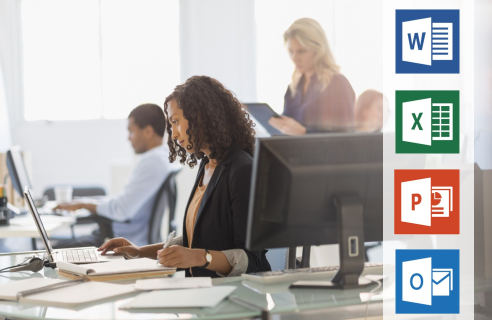 Microsoft Office is a popular and widely used suite of programs that are used in most small to large companies and by many modern-day businesses. It has been used for many years and has been developed and tweaked as time goes on to better suit companies' needs. By understanding how to use Microsoft Office applications, you will have a better chance at getting a job you might be interested in, since it has become the standard at a lot of different places of employment. You can also utilize Office applications for other things, like organizing your own personal finances, writing letters, or for personal email if you choose to utilize the Outlook application. It is such an integral part of many day-to-day operations that knowledge of the Microsoft Office applications are often a required skill in order to be even considered for a job interview. With the Office applications, you can create documents, make and edit spreadsheets, and do slick and informative presentations like a real professional. Even if you are new to Microsoft Office, it has a fairly easy-to-use interface and provides plenty of help inside of each application that can answer most of your basic questions as you go. In addition, you can take a course or practice at home by following some simple tips. Also included in Microsoft Office is Outlook program, which is a basic email program that many professional businesses use. Having good computer skills in general makes you an appealing candidate for the employment marketplace, but having skills in Microsoft Office can add even more appeal to your résumé. This shows a prospective employer that you have had experience in dealing with these particular products and that you most likely have demonstrable skills that they can use. If you'd like to practice learning some of these skills, try your hand at Microsoft Word, which is a word-processing program, and see what kinds of letters or papers you can produce. Word allows you to type, send, and print professional letters on letterhead, create résumés, write long papers, and produce any number of other types of documents. You can also include graphics, charts, and photos within the document to give it added visual appeal. Practice in Excel to create simple to very complex spreadsheets and databases with formulas included. Then, take a look through the many features of PowerPoint to discover how you can make an interactive and informative presentation that will wow any executive. Practice your keyboarding skills so that you can be more accurate and efficient when creating your work. People who can type at a fairly rapid pace often have a better chance at getting a career that involves office work. Typing skills tests are available online, and most are free of charge, so you can hone your keyboarding skills. There are plenty of resources available to anyone who is interested in learning more about Microsoft Office and basic computer skills. Start your journey toward better knowledge of these applications today. How to Work with Microsoft Office Software Suite • Copyright 1999-2019 © InLoox, Inc. All rights reserved.